And finally here is the video that demonstrates the main features. We have created an animated, explainer video for Ninja. It's a short video (1m 23s) that demonstrates what Bookmark Ninja is, what it is good for. Another video is coming soon that will demonstrate the main features. After a pretty long Beta period Ninja went into production! The Beta was long, but I think it was worth it. Thank you so much for all your feedback, comments, bug reports and feature requests! Ninja got into a much better shape by the end of the Beta than it was at the beginning. And this is what I would like to continue in the future, too. My goals for the upcoming years are to maintain the high level of usability and to continuously implement new features and improvements based on your feedback. Finally the pricing structure was also created, which is very simple and affordable. During or after the 30-day free trial users can buy an annual subscription which is $1.99/month, billed $23.88 annually. Subscription can be purchased on the Account page. Current Beta accounts will turn into the 30-day free trials this week. Except the top contributors, who were the most active during the Beta, they will be awarded with a Lifetime Free licence. You will get notifications about the account changes in email. Today finished the development and testing of the license manager module. A new Ninja build was also deployed today including this new development. You cannot see any changes right now but this new module will drive the whole licensing mechanism after the Beta period expires. In the next few days I will run some tests on the live server, too, just to make sure everything will work fine when it gets activated. In your mobile browser tap on Share and select the appropriate menu to send the website link in email. The bookmark will be added to your Catalog. 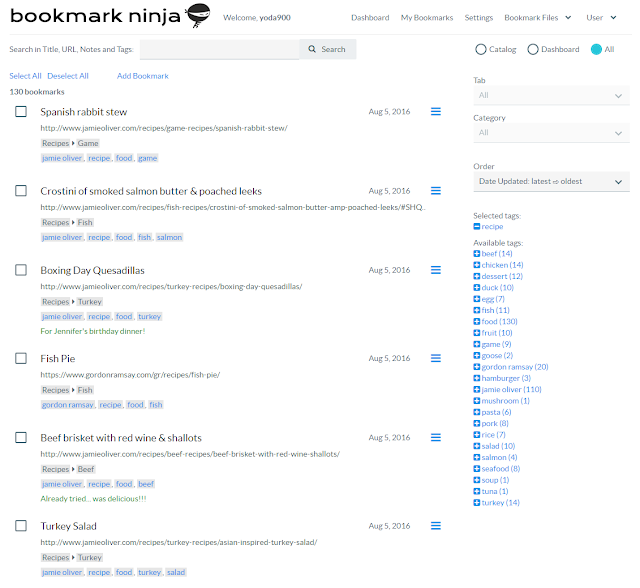 You can check your Catalog bookmarks on the My Bookmarks page. In the Catalog you can add tags to the bookmark or you can move the bookmark to the Dashboard. 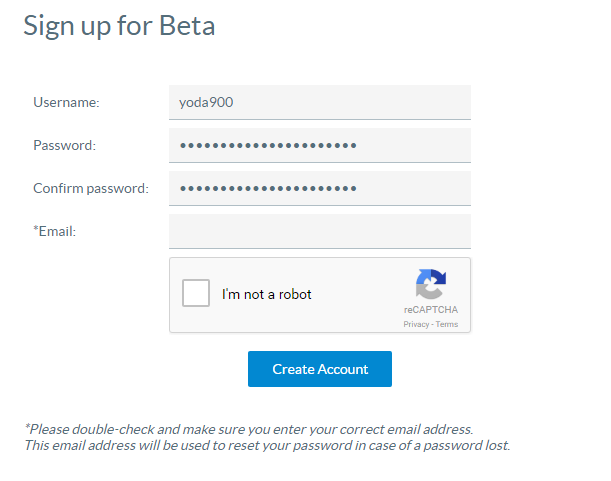 Make sure you send the link from your email address which was used to create your Ninja account. Until now paste was not allowed in the password fields during sign up. Based on the Beta feedback it was not a good decision because this made impossible to use any password manager. This has been fixed, from now paste is allowed so password managers are supported. 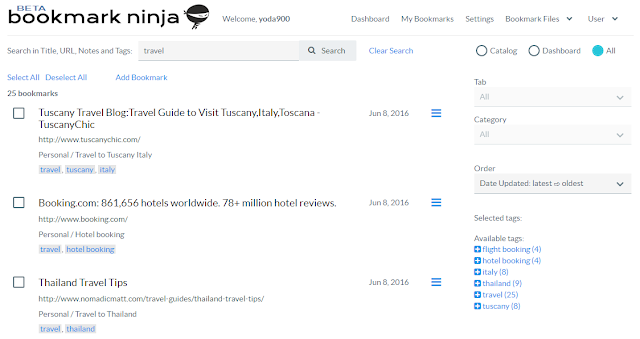 Until now if you had only one tab, the tab couldn't be deleted, since Ninja needs to have at least one tab. This has been uncomfortable when you wanted to delete the sample bookmarks. You either had to delete the category groups one by one or had to create a blank tab, go back to the other tab and then you could delete it. From now when you want to delete the last tab, the content of the tab will be deleted and you will get a blank tab. This will make the removal the sample bookmarks pretty easy. 1. Search has been extended to Tags. Until now you could search only in the Title, Url and Notes fields of the bookmarks, but from now the Tags are also part of the Search. This has been requested by many users. 2. After a search on the My Bookmarks page, if you selected/deselected tags, or changed any criteria settings (Bookmark Type, Tab/Category) the search result was reset. From now the Search stays active (the Search field will not be cleared) and the results will be evaluated based on the combination of the Search and the the criteria settings. You can clear the Search any time by clicking on the "Clear Search" command. 3. From now when you select the My Bookmarks page in the menu, the default Bookmark Type on the page will be "All". 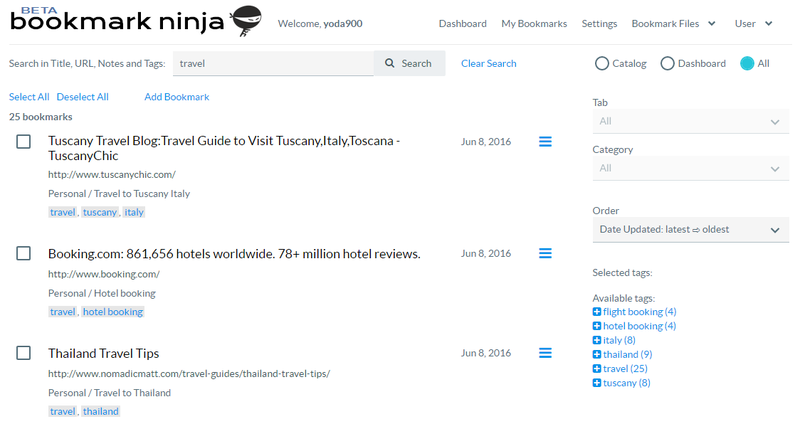 The reason of this change is to make possible to run a global Search immediately when the My Bookmarks page shows up. 4. On the mobile UI the Search text field on the My Bookmarks page was moved from the bottom to the top. This also makes possible to run a global search immediately after the My Bookmarks page showed up on your mobile device. Ninja on mobile Beta is live!! 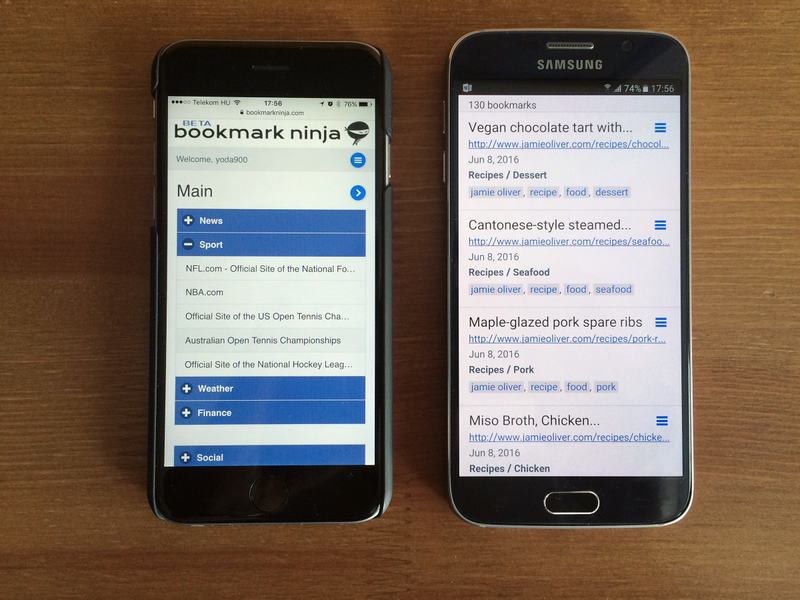 Simply launch the bookmarkninja.com website in your mobile device's browser (iOS, Android, Windows Phone). Important: There are also new browser buttons (bookmarklets). If you have already signed up and installed the browser buttons on your desktop computer before June 8th, then please remove them and install both buttons again from the "Install Browser Buttons" page (simple drag and drop). 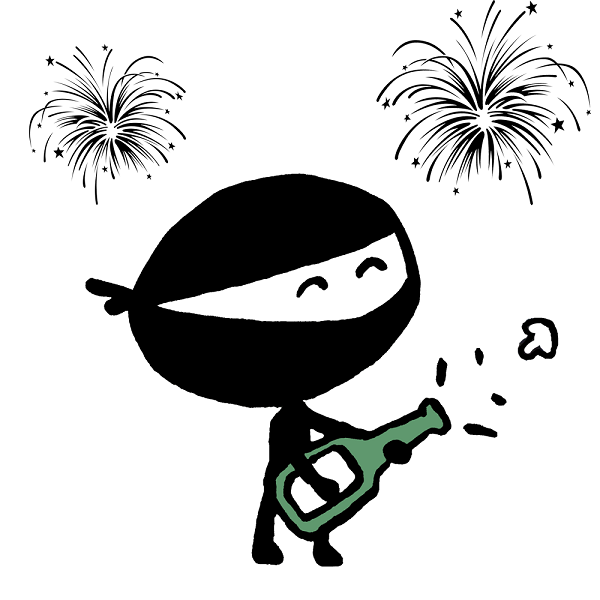 Launch Ninja on your mobile device only after you completed the button update in your desktop computer's browser. If you haven't signed up yet, first please sign up on a desktop computer, after then login to Ninja on your mobile device. To see the instructions how to install the browser buttons (bookmarklets) on a mobile device, please tap on the "Install Browser Buttons" menu after you launched Ninja in your mobile browser. This is going to be a another milestone in the life of Ninja. The truth is I underestimated the work to be done on the mobile web support, but finally I think the extra work and effort were worth it and the app got into a really good shape.Currently finalizing the documentation, updating the website and running some final tests before it will go live. Stay tuned! After 4 weeks of intensive development of the mobile support I can say that there have been quite a few issues that I didn't expect and had to be addressed. This caused some delay in the release schedule of the mobile ui. Based on the current estimate it will go to public Beta at end of May. Until then I plan to launch a "tip of the day" series on this blog, that will contain useful hints and ideas about the many ways Ninja can be used. So stay tuned, more posts are coming soon! Started to develop the dedicated mobile ui using PrimeFaces Mobile with jQuery Mobile. Goal is to have a native mobile app look with an easy to use user interface on all the 3 platforms (iOS, Android, Windows Phone). 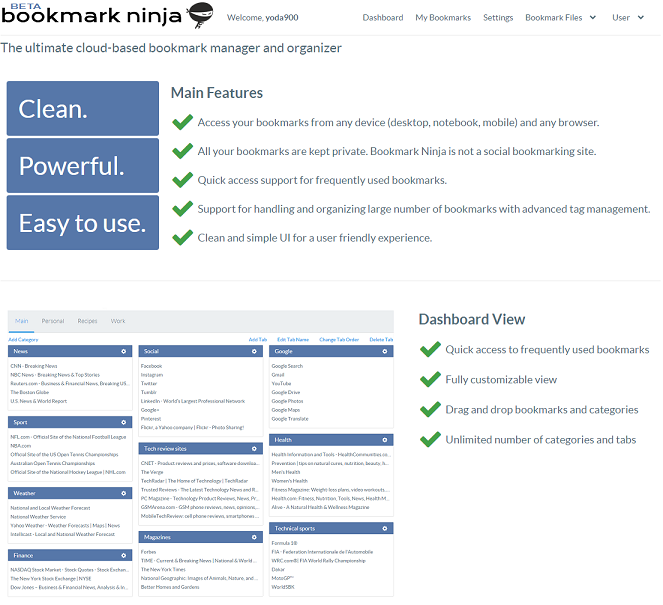 When the user doesn't perform any action on an opened web page for a particular length of time (in case of Bookmark Ninja this is 30 minutes), the server invalidates the session. After this if you click on any command button or link that generates a request to the server the web application will freeze. This hasn't been handled properly. Now in this case a "Session timeout. Click on OK to reload the page" message box comes up. If you click on OK, the page will reload and you can continue your work. Until now when you added a new category group on the Dashboard, the category has been always added to the top of the left column. This resulted a growing left column (if you didn't rearrange the categories, or you kept adding categories from the Add Bookmark dialog with the "+" button). From now if you add a category (both from the Add Bookmark dialog, and on the Dashboard) it will be added to the top of the shortest column. Beta forum is open. Feel free to share the bugs that you have found, your feature requests and questions. Please join the Beta Forum! Thank you for all the feedbacks, comments I received in the last 3 days, they were really very useful! Based on your feedbacks 2 serious bugs have been already fixed, both related to importing bookmarks. Many of you didn't like the popup message after saving the settings on the Settings page. I can totally agree, that message dialog was really irritating, I didn't like it either. The popup dialog has been removed, now a "Settings saved" message appears on the page for one second. Please make sure to read the Beta notes before you start using and testing Ninja. Looking forward to any feedback, comments, bug reports, suggestions. Other than the logo, a lot of progress happened. The server was migrated to a bigger volume, setup and configured the daily backups an also installed different memory, cpu, and disk monitoring tools. Today Bookmark Ninja reached a significant milestone. 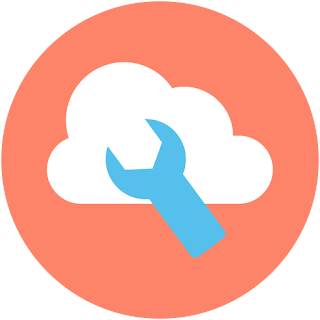 I have installed the SSL certificate on the server, so from now the site can be accessed through a secure connection (https). Many of my friends keep asking me when "ninja" will be available for the public. The truth is I'm more excited than anyone else, my guess is that it can go live and the beta testing can start in about a week... Mainly some marketing and beta related documentation stuffs left to complete. Stay tuned, I will post the progress till then. 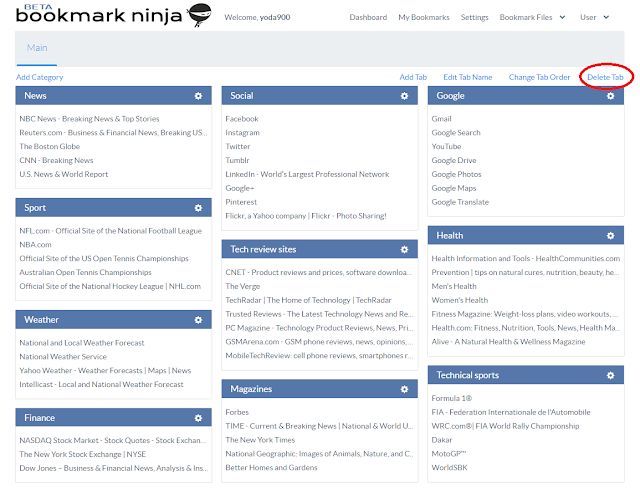 This blog will be the main communication tool where announcements, information will be posted about Bookmark Ninja. Of course I also plan to setup other social network sites like Facebook or Twitter, since others may prefer those ones. 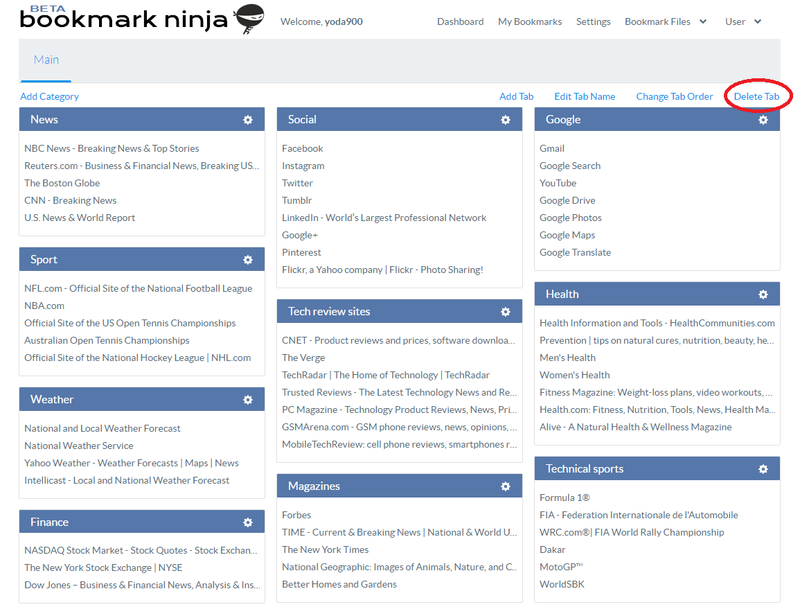 Bookmark Ninja is currently in the final development and testing phase. In roughly 1 or 2 weeks the site will go live and the beta testing will start.